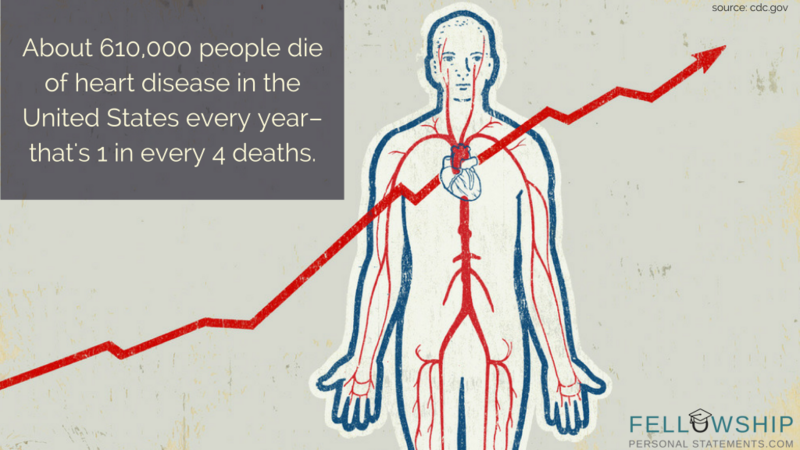 Why Do You Require a Cardiology Fellowship Personal Statement Writing Service? 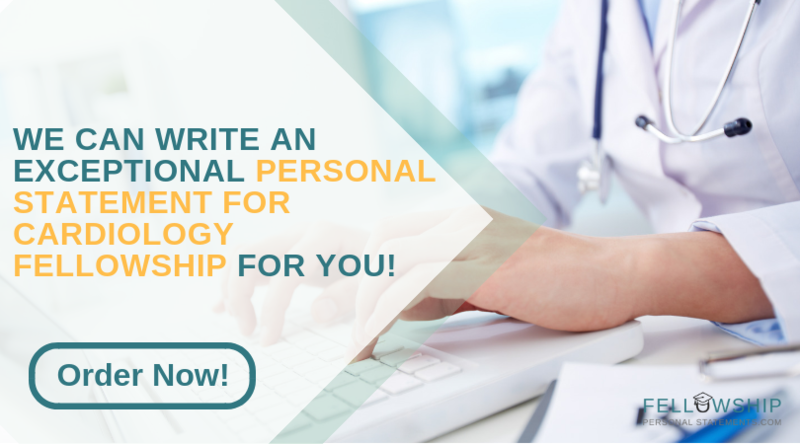 For the admission procedure, you will need to submit a residency and fellowship personal statement in cardiology as an integral part of your application. Without a doubt, it forms the basis for your application and requires to be composed absolutely error free and with perfect content. It is intended to let the admission committee know who you are and to evaluate you for suitability for their program. Envisioning a cardiology fellowship statement that will stand out from all the other participants is not easy. For this purpose, many applicants utilize our personal statement writing services for fellowship in medicine applications ensuring them the very best chances of acceptance. Cardiology has quite a range of specialties to choose from but which one is the most suitable for you? They will use information supplied to them by you through direct communication and create your cardiology fellowship personal statement or a gastroenterology fellowship personal statement in an engaging and unique way that will enable you to be outstanding among your competitors. Until you are absolutely satisfied with the statement that will be made available to you, you are entitled to an unlimited number of revisions. First paragraph: answer why you decided to choose medicine, what event or people influenced your decision. Second paragraph: write why you went with this particular specialty and what qualities you have that you think is a perfect fit for the profession. Third paragraph: what relevant experience you have that makes you a good competitive candidate? Fourth paragraph: what draw your attention to this specific program, how is it different from all others you’ve seen? Show commitment. Convince them that you are passionate about this profession and you’re determined to stick with it no matter how hard it can get. Behave. Don’t try to be super clever or all artsy and different. Present a look into the future. You need to show that you’ve spent quite some time thinking about your career and what you want it to look like. Highlight your strength. Subtly. It’s all about the art of bragging without actually bragging. Make use of your personal statement. Use it to set up a future interview. 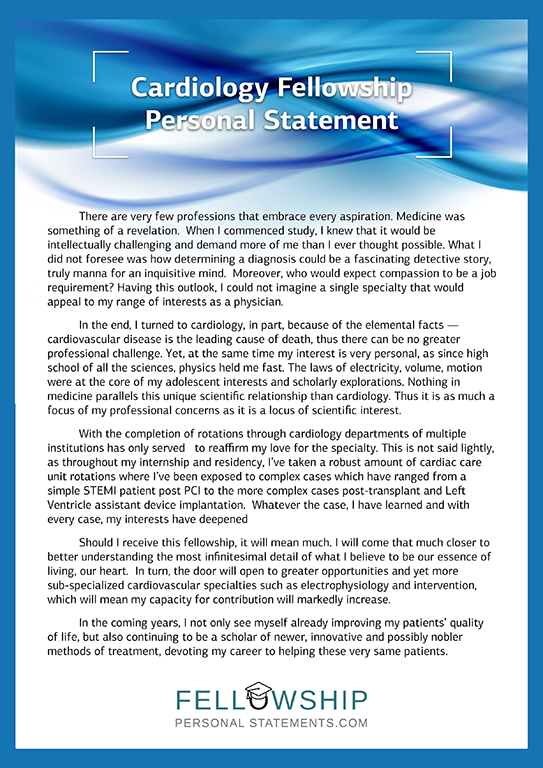 “Upon completing my targeted fellowship in cardiology, I plan to work in that field while working in two different clinical set-ups for the duration of five years in each. This will enable me to gain further insights while working with highly experienced cardiologists that will hopefully be willing to pass on their gained wisdom. When my father ran into problems with his heart while I was at the age of 10, I found out that what he actually was facing were problems with the pump that ran his system. My uncle explained it to me by comparing my dad’s heart to a water pump that will supply the necessary fluid to our fields. After having had this explained to me in such easy to understand terms it made me look at our bodies in a different way. While my father was hospitalized to undergo treatment, I was there whenever it was possible because he had been a good father to me. It also gave me opportunities to meet nurses and one was especially attentive to me. She let me ask questions related to my father’s heart and hearts in general. It was also explained to me that my father was suffering due to high blood pressure and how that is caused by his obesity. If you want to ensure maximizing your chances of admission, then you only have to contact our personal statement writing service!